I’ve always been a fan of kids, they just have this energy that brightens your day. Having a bad day? Hang out with a cute kid. Seriously, they will remind you what life is really about without even realizing it. They know how to live in the moment, laugh, be themselves, speak the honest truth and play. That’s the key, they know how play, and have a good time. Pretend play is so important for kids. Give them a cardboard box with a door cut out and a whole new world will emerge from their minds right before your eyes. It’s something I wish we didn’t lose as we got older, because it’s the purest form of creativity. The other day while pinteresting (is that even a word?) 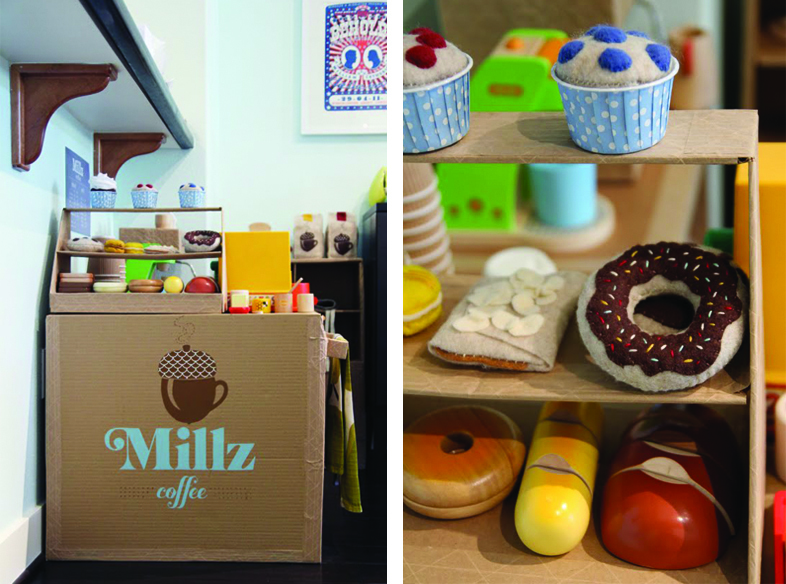 I stumbled across the worlds cutest cardboard coffee shop Millz Coffee, named after an adorable little barista; Emilia. I was blown away to say the least! Millz Coffee isn’t your average coffee shop. Traci at 45Wall Design created it completely out of cardboard for her daughter. 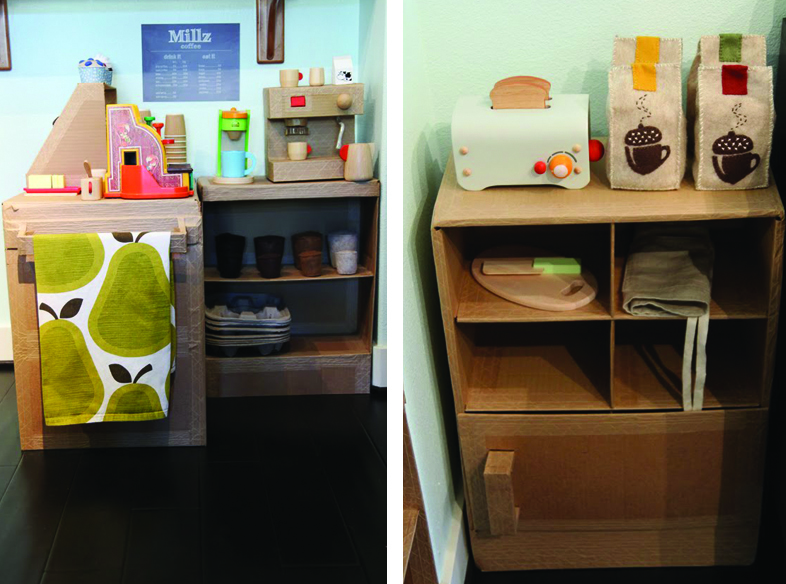 What started out as a joke, stemming from Emilia’s love of a wooden play coffee maker, turned into a reality that is so well done, even an adult could get imaginative in there. How delicious do those baked goods and that caramel Latte look? Photos from 45wall design. Everything right down to the last detail was thought of and then made by hand. 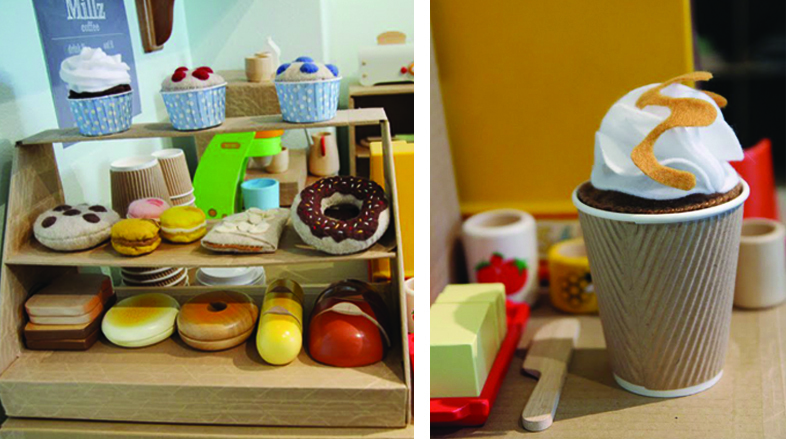 From the logo and menu to the cardboard counter, display and espresso machine, to the felt coffee bags, coffees and desserts this play coffee shop is a kids dream come true! I just had to share it with you! Be sure to check out the whole project here! Wouldn’t you have loved one of these as a kid? A little creativity really goes a long way. This entry was posted in Inspiration and tagged 45wall design, cardboard coffee shop, cardboard play, Children, coffee shop, creative, creativity, Design, DIY, Felted Food, inspiration, Kids, Millz Coffee, play, Pretend Play. Bookmark the permalink. Right? I feel the same! She did an amazing job!